A few weeks ago I started getting this idea of what it was like to spot for some hot shot race team. Every so often I will find myself watching a race and saying what I think their spotter is or should be telling them. This past weekend while at Richmond the final laps had me really questioning what it was like to be a spotter! The final six or so laps the top four were either side-by-side, nose to tail or so worried about making their cars extremely wide all while going 120+ mph working their way around a three-quarter mile racetrack. I could only imagine what radio traffic was like. 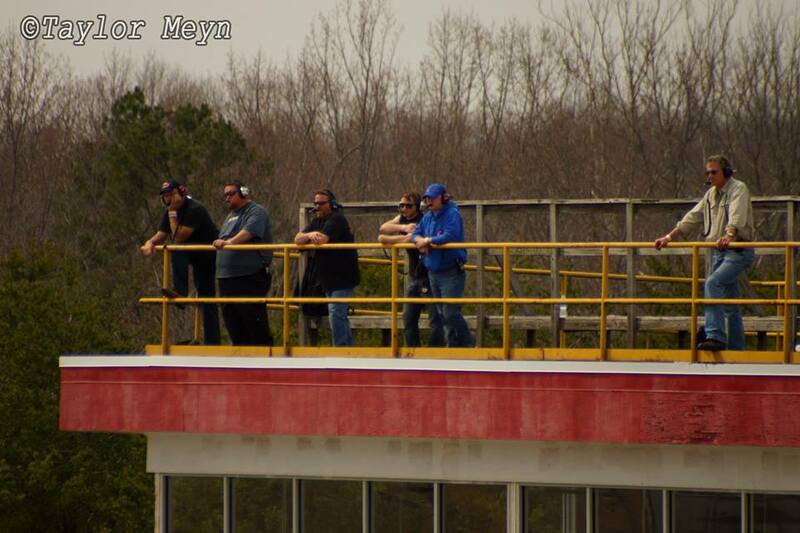 Spotters are a special kind a person to a race team. These guys or girls are responsible for watching everything that goes on around you and I feel that in a local racing series these guys don’t get the credit in which I feel they deserve. So I decided to take to my blog and for the lack of better terms GET NOSY and share my findings with you guys! I want to introduce a second series to the blog, a series where much like our popular driver series, we take you behind the scenes… well technically we are going to take you ABOVE the scenes and inside the head set of well pretty much any spotter who is willing and has the time to spare. The “Eyes in the Sky” series will be a special inside look into those men and woman who make the climb upstairs in sometimes freezing cold, scorching hot, or even rainy conditions to be those pair of eyes the drivers don’t have. There is no real need for me to go into a technical definition of what a spotter is, I am pretty confident that if you have ever been to or seen a race than you have some idea of what they are supposed to do, what I am more concerned about is do you know who they are and what they really do. Spotters didn’t start becoming big until the late 80’s to early 90’s, ten years after radios started to be used in team communication. In the beginning teams would just have someone somewhere else at the track; in another turn, a photographer stand, shoot some would even buy tickets in the stands to help get the better view. Around the mid 90’s is when racing organizations not only started making this a mandatory position but building special areas for those guys. A Chester, Virginia native who I had the pleasure of meeting (well actually he reached out to me via twitter and I dropped the ball on meeting up during the Mod race due to a conflict with my work schedule) via Twitter when we launched that a few months ago. Talking with him and a few other guys I know that spot really made me want to do this series because without guys or even ladies like Jesse, you could end up watching a demo derby every weekend. Vaughan, a loving husband for wife Mrs. Mindy Vaughan, and a relatively new father to 18 month old son Caleb! Jesse works around 14 hours a day as a supervisor for UPS during the week! 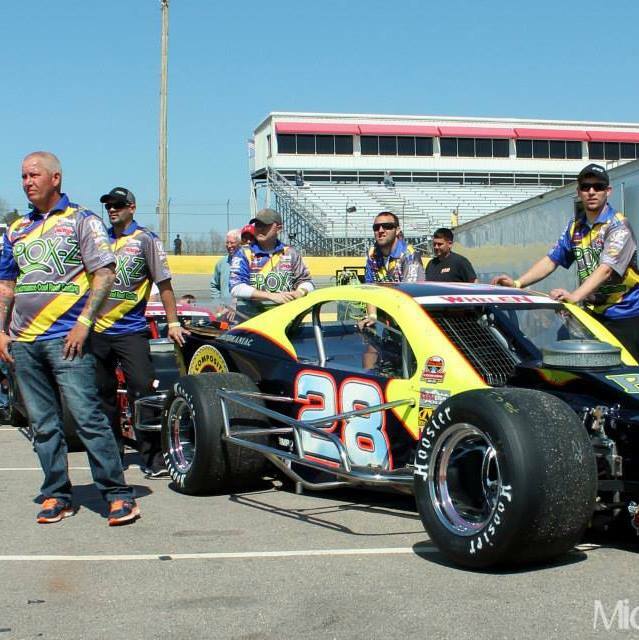 Just goes to show you these guys are just as dedicated to their sport as their drivers. 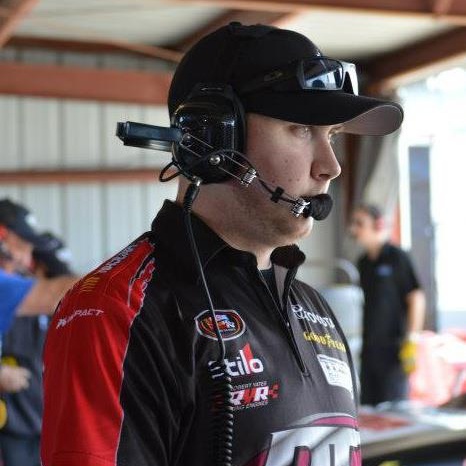 Luckily I was able to snag some time from Jesse to let you see into the life of a spotter, into the headset of the Whelen Southern Modified Tour. About six years ago is when things got started for Jesse, he spotted for Shayne Lockhart at a Martinsville practice when Lockharts normal spotter (who happened to be Jesse’s father) was in the pits. “From there I spotted for Shayne at Langley when dad wasn’t available,” Vaughan told me. 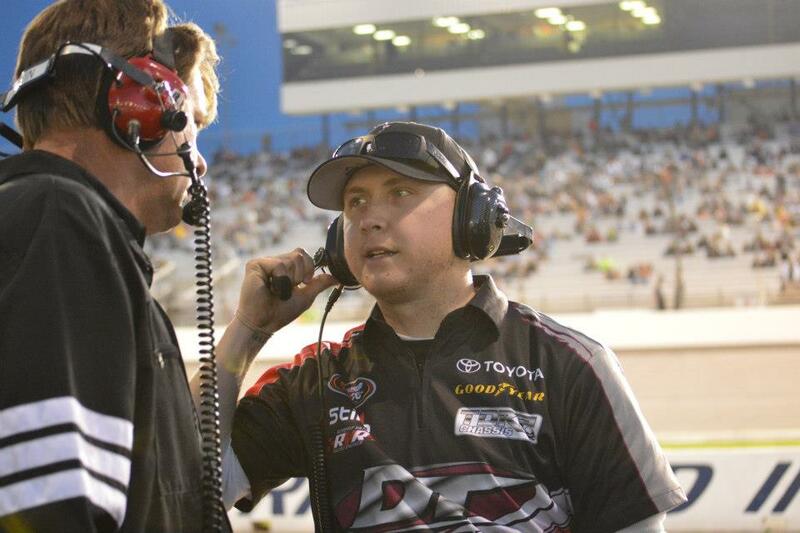 “Then I did some K&N East races for Sam Hunt, Eddie Johnson at Southside full time last year and Chris Johnson whenever I was off.” Jesse took over the full time position up in the tower just this year for four time series champ George Brunnhoelzl III after filling in twice last year, “He called me around Christmas and asked if I would be interested in spotting for him full time in 2014.” That is exactly what he has been doing this year and from our interview seems like he is loving every moment of it! What Kind Of Relationship Does A Spotter/Driver Need? A ton of people can argue all day long that being a spotter is so easy and that everyone can do it. Okay so I don’t have any hard evidence that to prove this wrong what I can tell you is that being that voice of reason over radio waves to that driver who is so angry they’re ready to blow a gasket, or making that decision in a split second that could cost your driver and a whole crew $20k seems like a daunting task to me. Not only that you have to know when and what to say, find out what your driver likes to hear and pay attention to whats going on around the track, of yeah and I forgot one other thing… you only have about 15 seconds (if the mods are running at Langley) to see the action, process it through your head, figure out what the outcome will be and relay that info to your driver! Spotter/Driver relationships are not the only thing guys or gals like Jesse need to worry about, you have to remember there are how many people up on that tower with you? “I also try to have a working relationship with most other spotters on the stand,” Jesse explains. Like most of anything in auto racing things are hardly ever forgotten and the same is true upstairs! Part of your job is to help your driver right? So being on the good graces of other spotters may just be the key to getting around that lap car a little better than most drivers. Growing up we were always told practice make perfect right? Well then you grow up like me and realize that there really is no such thing as perfect, which was your coaches way of telling you why you had to practice two hours a day. Sometimes though even practicing doesn’t make things easier, it makes you just a little more comfortable in your position. “The first time I spotted I didn’t know the best time to talk but after a few laps I smoothed it out,” Vaughan said. “[It’s] not necessarily easier, but its more natural to me now.” Was the response to a question about his thoughts if the job was easier or harder when he first got started. “It always has its challenges,” Jesse says. “Lapped cars, new tracks, ill handling race cars, but thats what makes it fun.” Every lap, every driver its something new. It’s not about the idea that you have more time up in the stands its going to be easier its about feeling more comfortable, its about taking taking in that new experience and applying to to a situation down the road, its about feeling more comfortable on that head set! Every athlete has his or her own things they do before the big event. Some like to just mellow out and relax, some have little rituals they do, others zone out in music and focus on the task before them. So I asked Jesse what he does to pump himself up! “I usually have a pretty long drive every week so I just listen to music and clear my head,” explained Jesse. Which made me stop and think, how high up the food chain do you have to be for teams to cover your travel? This is certainly things we will get to the bottom if in future dates. Once the team arrives at the track the guys work there tails of to get the car ready but try to have some fun while they’re at it, you gotta remember this is a volunteer type gig. If you can have a little bit of fun then it is probably time to move on. When it’s time to go racing Jesse makes sure to ‘fist bump’ and give every member on the crew a pat on the back, kind an acknowledgment to all their hard work and a thank you all in one. “GB3 and I give a quick hug and a few words then I head up to the tower,” Vaughan said. “When we get two to go I tell the guys in the pots good luck and give George one last little phrase of encouragement…” then its GREEN FLAG! 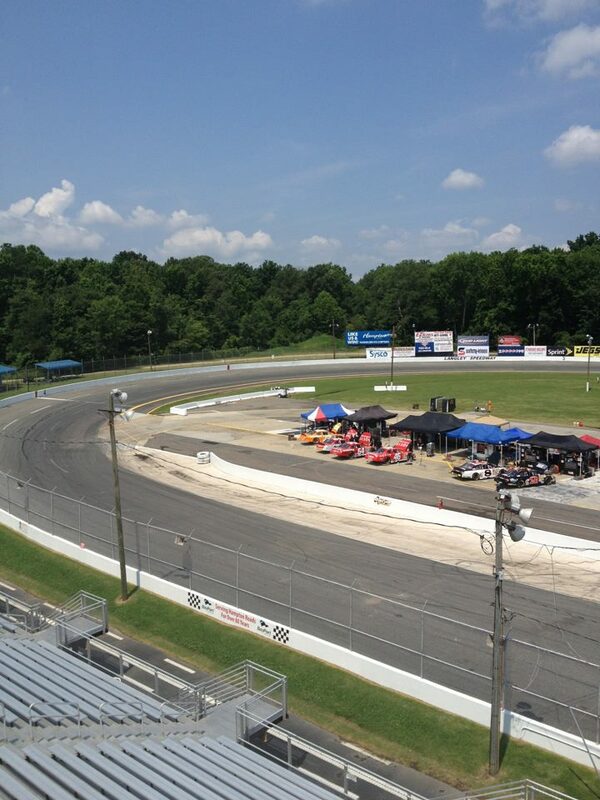 Vaughan and the entire GB3 crew at Southern National Motorsports Park. Photo courtesy of Michelle Stewart. Jesse made it pretty simple when I asked him about advise or things to do to make yourself a better spotter… experience, practice, experience, and some more practice. “I would say spot for everyone and everything you can as you’re learning,” Vaughan says about learning and getting better on the stand. ”Don’t turn down a a gig because you think the car isn’t competitive.” Use that “less competitive” car to your advantage, you know your going to be in traffic, you know your going to have to get them by the leaders more than once. The more time you have on the radio the more chances you have to learn when and what to say, as well as the more time you have to work with those guys who spot for a faster car. Making deals and helping make their job easier may just earn you a spot on the good side of their memory banks and in the eyes of the entire team. Not to mention you have to remember that everyone needs to start somewhere. 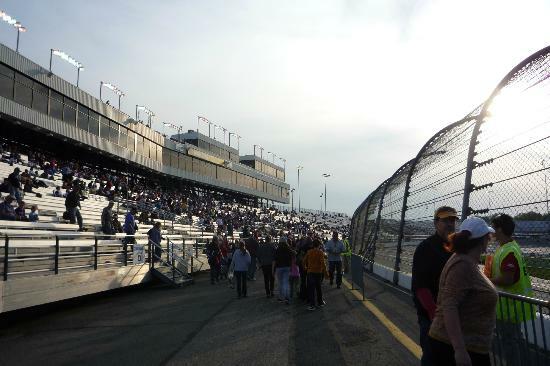 Something like that is a topic that I have been debating on writing about anyways, ‘being to big for your britches.’ Get your feet wet and your hands dirty, hell try an spot for every division at your local race track. The reason why I say this is because each car and each driver will present a new experience, problem or event that will help you in the longer run. Having worked with Jesse on many occasions, I can tell you that he is First Class! He does a super job and is very well respected.